Lara Croft, that name may ring a bell to some… it certainly did fifteen years ago in fact. It’s been that long since the raiding of her last tomb onscreen. In the present year 2018, the video game series turned action movie classic Tomb Raider, has been rebooted by director Roar Uthaug, in hopes of promoting the has-been franchise to the fifteen-year-later movie market. 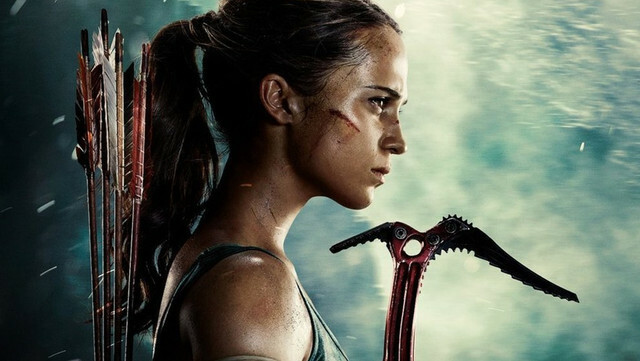 Alicia Vikander, Swedish actress and academy award winner, takes the role of exploring the mind of Lara Croft, as did Angelina Jolie in 2001; in hopes of re-igniting the fuel brought in the previous film, which many say was an underrated and underappreciated film franchise. The introduction of Vikander’s character begins in London, where she works as a cash-strapped courier. She refuses to accept an immense inheritance from her father, Lord Richard Croft, played by Dominic West; seeing as she was denial of his *spoilers* death. Rather than accepting the money, she decides to undergo his mission in heading to the East, searching for the Himiko tomb; to where the Japanese death queen lies. The opening was quite underwhelming and shaky to say the least and could have been handled with a bit more vibrance, however; with A-List British actors such as Derek Jacobi and Kristin Scott Thomas, the film begins to pick up the pace especially once they head to Asia, where all the magic of action occur. Just as it’s original take Cradle of Life (2003), the 2018 film franchise is once again in Hong Kong, where Croft hires Daniel Wu’s drunken sailor for assistance as well as a skillful chase along the Aberdeen harbour boats. Thereafter, they seek an isolated island in Japan where a dodgy, distrustful establishment named Trinity, composed and dictated by the fearful Vogel; played by Walton Goggins. Now, onto the main reason you are reading this review… which would hopefully be the review of the plot itself, the actors, the direction and just the overall film- let’s dive in shall we? It’s clear to acknowledge and appreciate that director Uthaug utilizes the scope of Asia and aims to give the film a diverse range of locations to keep the audience in suspense and on their toes for more locations. In saying that, the actions scenes seem to have some shaky edits and an over-dependence on the CGI realm, just as most modern actions films do. However, this over-reliance does prevent opportunity for creativity and ambitious physical sets that appear more realistic and authentic to the viewer, especially given that Croft promotes a somewhat au naturale vibe. It’s also a given fact that Croft’s physical appearance has changed in the reboot, but Oscar winning Vikander (notable in film The Danish Girl) proves her acting abilities are still strong and does exceptionally well in settling into the role like the Oscar pro that she is especially given that the dialogue is quite messy in some parts and motives of some characters’ aren’t clear to comprehend either. The movie coherently aligns with its intended adaptation of the 2013 Tomb Raider edition of the game and takes some concepts from the game such as the plane hulk escape, integrated from the game. The different physical stunts are satisfactory, but there seems to be something missing as it just reaches the minimum line of satisfaction for the viewer and some scenes come across as underwhelming- there is not much room for originality or refreshing material. Overall, the reboot does have some well thought out elements and both old and new fans can find joy in the film’s adaptation of the 2013 reboot game. However, it is not much of a risk-taking film and viewers can expect just the a teaspoon of action, but not the tablespoon unfortunately.